The play of a masked crusader was not enough for the North Dakota State women’s basketball team in their return to Fargo. A visit from the offensively proficient Denver Pioneers did the Bison no favors coming off a midweek loss to North Dakota in Grand Forks. The guests got hot from the field in the second quarter to put the game away by halftime to beat the Bison 87-67. The path of least resistance for the Bison offense was highlighted quickly, as Marina Fernandez found a cutting Emily Dietz for the first points of the afternoon. At UND, Dietz took an inadvertent elbow to the nose and wore a mask in the contest Saturday. There were negligible negative effects for the junior, as she was the only Bison with multiple buckets in the first quarter. “It’s a lot better than the one I wore at UND. I can actually see out of this one,” a smiling Dietz said postgame. Denver also did not have a player with multiple field goals in the first 10 minutes, but seven Pioneers were on the score sheet. Add that to NDSU missing on their last five shots in the quarter and Denver held a 18-11 edge after the first. Then the wheels came off. Bison head coach Maren Walseth asked for more competitiveness in the huddle. 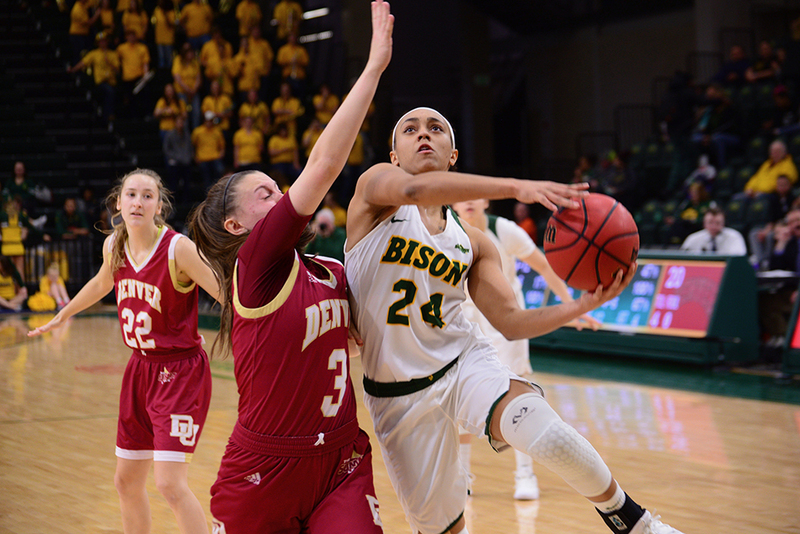 The first DU possession saw Madison Nelson make good on a second chance point opportunity, and Walseth was animated calling for timeout as the Bison inbounded the ball. The extra competitiveness didn’t come until late in the frame. Denver connected on eight straight shots as part of a 15-0 run. “I don’t think they did anything special on offense. I think it was a lack of effort on our defensive end. We’re better than what we showed today,” Dietz said. That was the ball game at that point, but somebody forgot to tell Dietz. The Bison center led all scorers with 10 at the break. The West Fargo product continued in the second half. Dietz scored eight straight points for NDSU, most while under duress in the post. Dietz’s energy started to rub off on the rest of the team, mainly Sofija Zivaljevic. The transfer from Iowa State started attacking the Pioneer defense, getting a layup before hitting four shots from the free throw line. Defensively, there was not a lot that could be done to stop the Pioneers, who attacked from all angles. Going into the fourth, nine of 11 players had scored points and the two non-scorers had been on the floor less than two minutes each. Samantha Romanowski was the centerpiece to the Denver offense. The senior knocked down her second 3-pointer of the afternoon to give the Pioneers a 28-point lead late in the third. The fourth quarter was played, and both teams got to the charity stripe often. Dietz continued her tear, laying in late in the game for points 25 and 26, a career high. Those points were part of a 7-0 run from the Bison that was far too little far too late. Dietz’s 26 led all scorers on the afternoon, but Zivaljevic was the only other Bison to break into double-digits for scoring. Up next for the Bison is a tricky home test against Oral Roberts. The Golden Eagles took the first game of the season 101-72, the most points ORU has scored this season. NDSU will be wearing pink jerseys for breast cancer awareness. Tip-off is set for 7 p.m. Wednesday night.